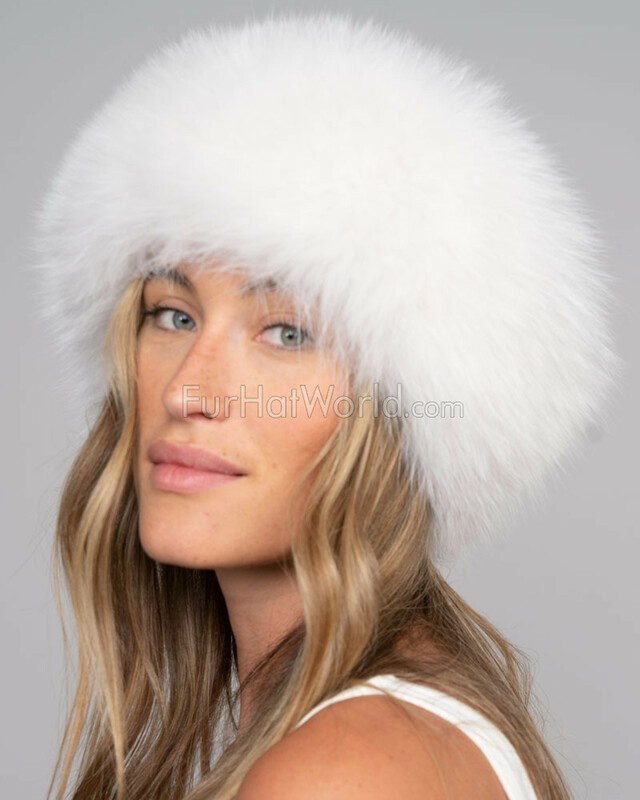 White Fox Fur Roller Hat with Leather Top. Genuine fox fur hat with leather top. 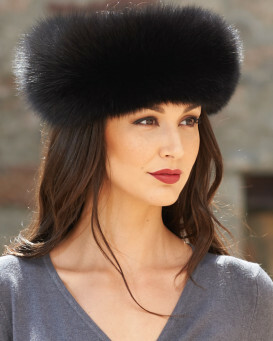 This ladies fur roller hat features a wide band of white ranch raised fox fur with genuine leather on the crown. Exceptional quality. One size fits all - Stretchable elasticized interior brim for a perfect fit every time. 4.5 / 5 from 12 customer reviews. "Unfortunately I had to send it back, it was gorgeous but the large band of fox fur was too much for me, it just didn't look good on me. Well made, would have been nice and warm, regrets"
"Excellent service, delivered as promised on time and un-damaged. It is a beautifully crafted hat. The fur is soft and long. The leather is supple and very white. Thank you a "bucket list" item fulfilled . My very own Dr. Zhivago hat." "Loved it. Fit nicely.I liked that it covered my ears. I ended up sending it back because it was not the right shade of white and I was trying to match my fox coat." "The hat arrived so quickly. I am delighted with it would like another one"
"I absolutely love this hat! It is warm and comfortable and I will use it all winter. It came quite quickly and the only delay was on the US postal service side but then it is Christmas shopping season so one has to expect the unexpected. I have had many compliments on the hat already and it is my very favorite hat now. I would recommend this website!" "The hat I ordered arrived today & I am thrilled with it - many thanks for producing such a beautifully made hat in such a gorgeous fur & for sorting out shipping it to the UK. Fantastic! Kind regards, Benita"
"I bought the hat for my Wife as an early Christmas present. She is very pleased with the product and delivery timescale. She is now thinking of getting a coat to match. But if she does that, And with the hat, I won't be able to find her if it starts snowing and that."